You are already aware of the importance of standardizing and operationalizing clinical pathways. Now, consider taking the best of your evidence-based practices and blending it with business process automation and dynamic workflow. The result? Organized and standardized patient care from admission, through post-discharge. Imagine the improved clinical outcomes and views into captured variations which affords you more time to focus on the delivery of extraordinary patient care, the "true north!" 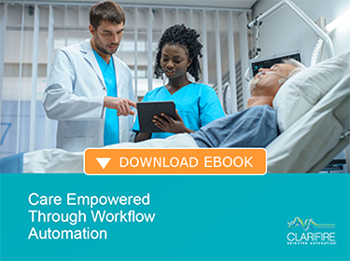 Hospital systems, post-acute care providers and physicians are achieving better clinical and financial outcomes when automating clinical pathways with CLARIFIRE HEALTH® workflow. Utilization of Nurse Navigators can play a vital role to the oversight of health outcomes by coordinating the management of the patient pathway via workflow. Delivers a consistent stream of seamless integrations between all providers responsible for contributions within the care pathway. Presents visibility into clinical variations to the standard pathway, pinpointing process level changes and aligning outcomes. Correlates outcomes to variations and positive clinical outcomes, resulting in the ability to change and improve care pathways. Provides accessibility to system level critical trends in real time. Reduces patient length of stay and readmissions. Similar to clinical pathways, any diagnosis can benefit from automation, such as heart attack and pheumonia. Don't see your pathway or service line here? Not a problem. CLARIFIRE HEALTH is configurable and easily personalized to your process. To request a demo or talk to a CLARIFIRE healthcare advocate, please contact us. Interested in improving patient outcomes with clinical pathways PLUS workflow? "Upon go-live, we were able to immediately trend negative clinical variations in lab practices and weight assessments, which are a vital part of patient decisioning and outcomes for our Congestive Heart Failure Pathways." "The automated alerts indicating patient declining metrics have been invaluable, enabling rapid responsiveness - we are truly working in real-time now."